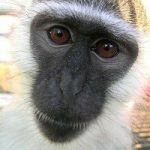 Vervets live throughout the savannas and mountainous areas of East Africa, from Sudan, Ethiopia, and Somalia in the north southward to South Africa. 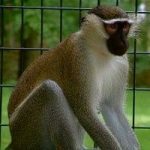 These medium-sized Old World monkeys, who may grow to about 2 feet tall and weigh up to 17 pounds, are distinguished by greenish-greyish bodies and small, black faces with white whiskers and a stripe of white fur across their foreheads. In the wild, they largely live on a diet of flowers, fruits, and leaves, although they’ll also eat anything from insects and eggs to birds, rodents, or agricultural crops—a habit that earns them the scorn of farmers. But when chased by farmers or predators, including eagles, pythons, and leopards, their prowess as climbers, jumpers, and swimmers helps them avoid capture. What they’ve been unable to escape, however, are the Africans who hunt them for food or snag them in large numbers for biomedical research in the U.S. and elsewhere. Bob is a former pet from Virginia who arrived at the PRC in 2009 at less than one year old. Due to his youth, he has a lot of energy and is extremely active. 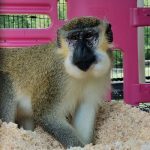 Caleb arrived at the PRC in 2011 at less than one year old, after being surrendered to us from a pet situation in Frankfort, KY.
Vernon arrived at the PRC in 2004 after being confiscated from an animal hoarder in the Northeast. Nervous and suspicious of other monkeys.